War and the use of weapons has been part of the human equation since the beginning - against other humans, animals, and the unknown. 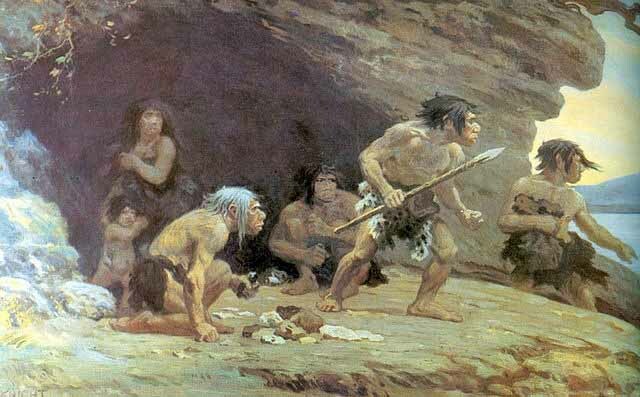 Early humans used rocks, clubs, axes and spears as weapons became more and more sophisticated - today when we have weapons of mass destruction. Petroglyphs from around the world depict early use of weapons. Cave art in Spain and France - dating from 10,000 to 5,000 BC - show men fighting with bow and arrows. 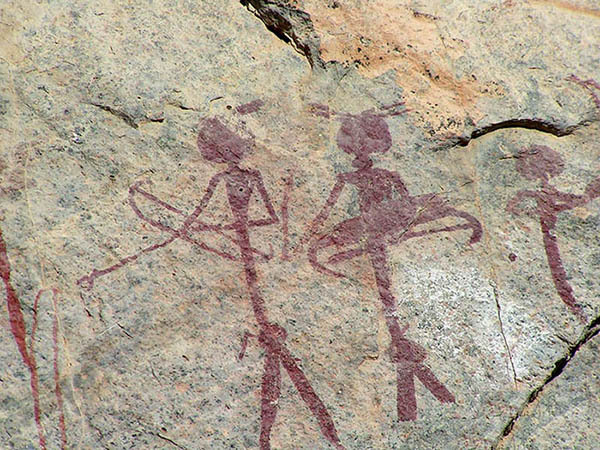 As early as 6,000 BC African cave paintings show people armed with clubs. Much later wooden clubs were still used in Africa and the Pacific. Early axes were made of wood and stone. (Like the tomahawk of the Native Americans). However the sword was not a practical weapon until people had become skilled in making things from metal. In Australia Aborigines hurled large boomerangs at their enemies. However war boomerangs were not designed to come back. Aborigines also fought with spears. To protect themselves they carried a curved stick, which was held in the center. It was used to parry spears and boomerangs. A horrific spinal injury caused by a bronze arrowhead didn't immediately kill an Iron Age warrior, who survived long enough for his bone to heal around the metal point, a new study of his burial in central Kazakhstan finds. he male warrior was likely between 25 and 45 years old, and stood 5 foot 7 inches (174 centimeters) in height, which was tall considering that his people stood an average of 5 foot 4 inches (165 cm) in height, the researchers said. They found his grave, an elaborate burial mound called a "kurgan," after getting a tip from local people who live in the area. Despite a lack of archaeological evidence, the first North Americans have often been depicted hunting with spear-throwers, which are tools that can launch deadly spear points at high speeds. But now, a new analysis of microscopic fractures on Paleo-Indian spear points provides the first empirical evidence that America's first hunters really did use these weapons to tackle mammoths and other big game. The new study has implications for scientists' understanding of the way Paleo-Indians lived, researchers say. To understand the inner workings of extinct hunter-gatherer societies, it's important to first learn how the ancient peoples got the food they ate, because their lives were closely tied to their subsistence activities. Current models of Paleo-Indian society are based on the assumption that hunters sometimes used spear-throwers, or atlatls. A highly skillful and delicate method of sharpening and retouching stone artifacts by prehistoric people appears to have been developed at least 75,000 years ago, more than 50,000 years earlier than previously thought, according to a new study led by the University of Colorado at Boulder. A delicate, sophisticated way to craft sharp weapons from stone apparently was developed by humans more than 50,000 years sooner than had been thought. The finding could shed light on what knowledge people were armed with when they started migrating out of Africa. The stone points are approximately 64,000 years old ... Researchers in South Africa have revealed the earliest direct evidence of human-made arrows. The scientists unearthed 64,000 year-old "stone points", which they say were probably arrow heads. Closer inspection of the ancient weapons revealed remnants of blood and bone that provided clues about how they were used. The arrow heads were excavated from layers of ancient sediment in Sibudu Cave in South Africa. They dug through layers deposited up to 100,000 years ago. Marlize Lombard from the University of Johannesburg, who led the research, described the approach she and her team took as "stone age forensics".